2019’s brand new styles in women’s clothing were seen on the runway just a few short months ago. Now, they are hitting stores with vim and vigor. This is the time to update your wardrobe and prepare for the incredible year of fashion that is 2019. 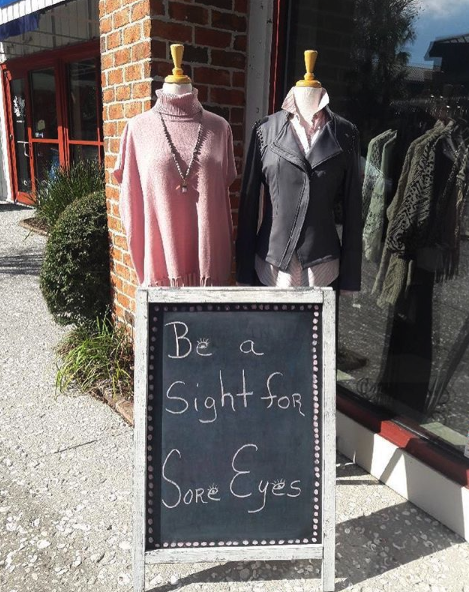 Whether you have a personal stylist or are still just getting your feet wet with this whole new fashion swing, the Kiawah team is here for you. Fashion education is our passion—especially in women’s clothing. Ultimately, we desire for you to look as good as you possibly can so your inner confidence can radiate through everything you do. So without further ado, let’s dive into some of the chief designs that will be all over magazines this year. 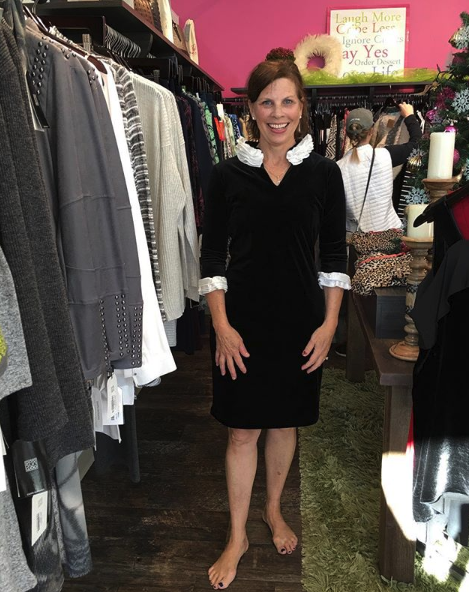 The Sara Campbell Black Velvet Dress features a knee length straight skirt. The savvy design makes it perfect for a variety of occasions. With its mid-length sleeves and white ruffles, this dress is perfect for the workplace. It offers mobility, but professional practicality. You can easily throw on a pair of pumps and pantyhose for a chic office look. Or, let your hair down, and put on a few statement accessories, and you have a lovely little black dress for that special Valentine’s day dinner. The luxurious velvet is soft to the touch and offers a clean texture to give this piece a little oomph. The delicate drape of the Foxcroft Sweater makes it an ideal layering piece. It features a turtleneck for warmth and a loose framework which makes it both cozy and comfortable. Layering this piece over some skinny jeans or leggings makes it a great winter ensemble. The soft pink pigment calls to the colors of our cheeks in the colder seasons, naturally enhancing our beauty. Pairing this sweater with Clara SunWoo’s pleather jacket gives the look a bit of an edge. Wearing the sweater alone has a sweet connotation to it, but the edge of the jacket gives off an air of authority and confidence. Clara SunWoo’s jacket is also completely washable, making this ensemble extremely convenient as well. Colorblock sweaters are old school—not going to lie. However, retro prep is coming back, so color blocks are the way to go. This Joseph Ribkoff Jacket features a warm, study construction giving this piece excellent longevity. 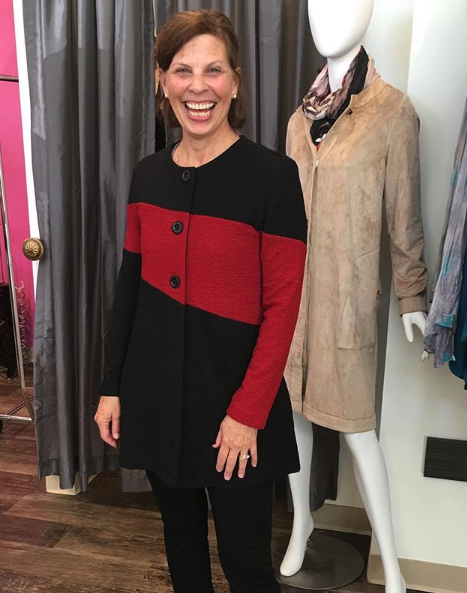 The red and black diagonal color block calls back to older styles but offers a classic, almost holiday look. This makes it an ideal accessory for events, parties, or even a night on the town. Pair it with the lovely Clara SunWoo Ponte Pants for a truly seamless look. Here at Kiawah, we are all about staying on top of the latest fashions. With regularly scheduled new shipments, our reps work tirelessly to ensure that you have access to all the pieces you need in order for your 2019 wardrobe to truly shine. Our personal stylists are here to assist and advise as you move forward on your fashion journey.